In the 1960s only girls who had passed the 11+ and had selected the school on their 'choice of secondary school within Wolverhampton Borough form' were considered for entry. Those who did apply were ranked according to their score on the 11+ test and only the top candidates were offered a place. Wolverhampton Girls' High School and the Boys' Grammar were the top Grammar Schools in Wolverhampton. It was considered a real privilige to get offered a place and people thought you were very clever if you attended the school. Scary! Entry was for 90 girls back in 1966. There were initially three forms of 30 girls each. Places that became vacant within that cohort could be applied for, but the applicant was required to sit an entrance test to ensure they were of the correct calibre. Girls who joined later were placed in forms according to the discretion of the leadership and our K form swelled to over 30 during our years at the school. In the 1960s the school leaving age was 15 and Miss Scargill ensured that parents and girls were committed to attend the school for seven years and to take A Levels. 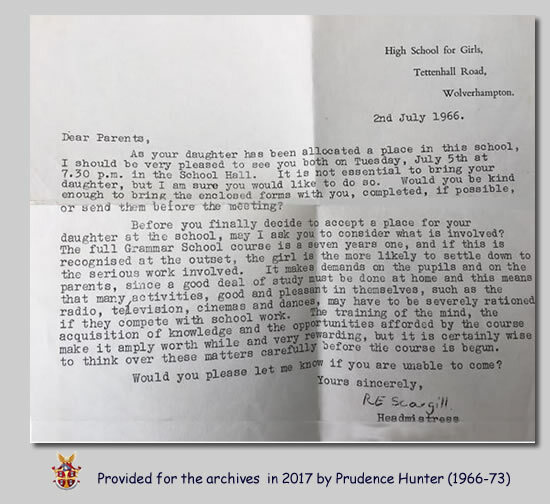 This was not a common thing for working class girls in the 1960s therefore the Headmistress did her best to encourage those from all backgrounds to 'pursue excellence' in their studies. I know that this letter and that initial meeting on July 5th really scared my mom. She assured me that if I was unhappy at the 'scary school' she would take me out and get me into St. Peters! (and that was before I even stepped foot in the place! She had concerns that the school expected me to stay on until I was 18. She had rather hoped I would be contributing to the household budget at 15... the idea of getting qualifications seemed pointless to her as a woman's place was in the home bringing up children and looking after her husband.